April Fools' Day is celebrated in different countries around the world on 1st April every year. Sometimes referred to as All Fools' Day, April 1st is not a national holiday, but is widely recognized and celebrated as a day when many people play all kinds of jokes and foolishness. Here are ideas for April Fools jokes. While many are well know pranks you could modify them to suit your circumstances. This April Fool's joke works every year. Superglue high-value coins to a location where lots of people walk pass. If possible stand at a discrete corner and make a video of your prank. ** Convince him your parents are coming to visit... for a whole month. ** Create a crying, screaming scene in front of his friends after accusing him of thinking you're fat. This is fun for the whole gang! Your guy and his friends get to see what a great sense of humor you have and how you like to include the whole crew on the joke. ** Get his boss to pretend to fire him. "Don't worry, honey, there's always unemployment!" ** Put a picture of one of those age projection simulations on his bathroom mirror in the morning. Make sure to enter extreme lifestyle choices like excessive tanning, drinking, smoking, eating to create a severely haggard and aged image. He should learn to be less vain. ** Show him a picture of a sickly, disabled animal and announce you've adopted it. Run through the medication/physical therapy schedule with him and watch him turn white. Then watch him turn red as guilty relief washes over him when you tell him "April Fools!" ** Leave a bunch of magnum condoms around for him to find. Reassure them that they're not for him, just leftover from an old boyfriend. Then present him with "normal" sized condoms for his use. ** Tell him you lost your engagement ring. ** Make an utterly disgusting meal for him. ** It's the thought that counts, right? ** Tell him you cheated on him. With someone completely ridiculous, like your landlord or your gay best friend. ** Change outfits every 30 minutes, and act like nothing's different. Then serenely question if he's feeling all right when he notices. Ladies, make sure it's extreme enough to catch his eye. We know how men are about noticing clothes. ** Paint his soap bar with clear nail polish. That way, it won't sud up. Just make sure you have a replacement on hand when he eventually calls you in to fix it. ** Replace his underwear and socks with zany, crazy patterned ones. Then insist you don't see whatever the pattern is. "They're just white socks... I don't get it?" 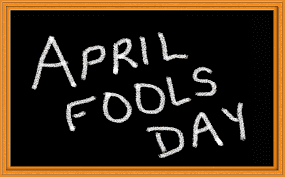 April Fools’ Day, also called All Fools’ Day, is celebrated every April 1st in the United States. While it is not officially recognized as a holiday, many celebrate by pranking, or pulling practical jokes on, their colleagues or by organizing larger-scale hoaxes.